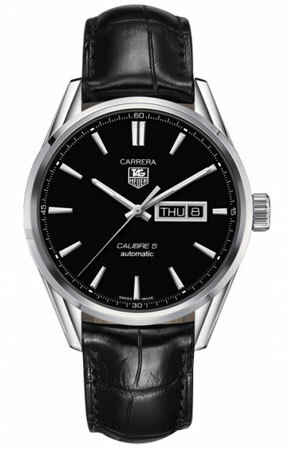 Buy this new Tag Heuer Carrera Caliber 5 Day Date war201a.fc6266 mens watch for the discount price of £1,870.00. UK Retailer. Opaline black dial with a sunray effect. Polished steel hour and minute hands with luminescent fill. Beveled fine brushed and polished stainless steel indexes. Day/Date window at 3 o'clock framed in hand-applied, beveled stainless steel .